Also known as asparagus bean, and barbatti in Hindi. These plants are both heat and wet tolerant. 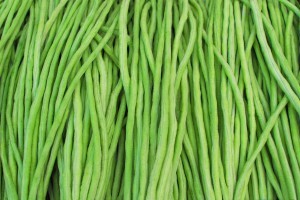 Pods: long and slender, 50 to 70 cm long, medium green color. The vines are rampant climbers, so plant next to a bean tower or trellis. Maturity: beginning of harvest 50-60 days after sowing. Pick beans when they are the width of a pencil.